Tiffany Threadgoud - ReMake It! 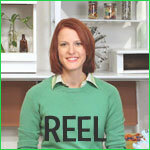 Tiffany Threadgould is an eco-lifestyle expert who spreads recycling inspiration with easy do-it-yourself solutions. Tiffany began with an MFA in Industrial Design from Pratt Institute, and now hones her upcycling know how as Head Design Junkie at the mega recycling company TerraCycle. Her own company Tiffany Threadgould has been featured on CNN, Every Day with Rachael Ray, the New York Times, and countless magazines and blogs. Tiffany's philosophy on upcycling prompted the New York Times and Make magazine to deem her "the Martha Stewart of Garbage." She has given lectures at the American Folk Art Museum, Industrial Design Society of America and Maker Faire NYC, as well as appeared on the National Geographic tv series Garbage Moguls. She can be booked for speaking engagements and tv appearances.See Tiffany's full resume. 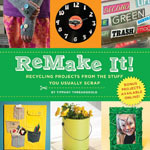 Tiffany wrote a super fancy do-it-yourself recycling book called ReMake It! Recycling Projects from the Stuff You Usually Scrap (Sterling Publishing 2011). The book is heralded as the go-to for all things upcycled and DIY, and it's filled with nearly 100 projects that you can create from the stuff you usually scrap. You should also check out my series of DIY recycling kits under the ReMake It name, too. You can transform wine corks into a trivet, glass bottles into a lamp, and much, much more. Don’t scrap it, ReMake It! Purchase the book and kits online at KarmaKiss.com or at Amazon.com. If you’re a store and would like to make a wholesale purchase, please contact Streamlinenyc.com for the kits and Sterling Publishing for the book. Tiffany Threadgould and her fellow crafty instructors offer workshops, classes and party activities where materials and instructions are provided to make easy, fun upcycling projects. We also design upcycling projects for companies who would like to promote their brand as eco-conscious and fun-loving. We take branded packaging and design projects which can be completed by fair or event-goers in 5 minutes or less. We believe smart brand promotion and upcycling innovation go hand in hand! To learn more, see our Event Page. Sustainable design plays a major role in Tiffany's upcycling approach. She can be hired out to give your office, store, restaurant, hotel lobby or home an upcycled interior design makeover.. See our design portfolio and get inspired! We try to travel as much by train as possible, but whenever we travel by airplane we offset every trip with carbon offsets through TerraPass . Plus, every year a portion of our profits go back to organizations dedicated to helping preserve our environment. Most recently we supported Green Map, Sustainable South Bronx, and Transportation Alternatives.